Importing JDM cars to USA - JDM EXPO - Best exporter of JDM skyline GTR to USA, Europe, Canada, Australia and more! JDM EXPO is now in the USA! JDM EXPO – leading sports and classic car exporter based in Japan is proud to announce the opening of its new JDM auto import and sales facilities in New York, USA. Now you can get all the benefits of working directly with an exporter in Japan while enjoying the safety, security and ease of purchase that you have when working with a company here in the USA. Until now it was never as easy to import your dream JDM to the USA as it is today! With the opening of our own office in New York, now we can import JDM cars at any major ports of the USA. The cars we import are 25 years old and fully exempt from EPA and FMVSS regulations, making it 100% federally legal to drive in the US highways. Now, only though us you can buy your dream JDM car directly from Japanese dealers and auctions without ever having to worry about the passing through a mountain of red tape paperwork. Our New York office provides all the import and registrations services, and after the purchase arranges the delivery of your dream JDM car to your front door in the USA ready to be cruised around the highways of the US. If you are a customer who wants to test drive your car before purchase decision, we welcome you to visit our New York office. In New York, we always have at least several JDM cars available for sale which you can test drive to feel the excitement our cars provide. Currently, the majority of the JDM vehicles we import are Nissan Skyline, R32, Skyline GTS-t, Nissan Silvia S13, Honda NSX and others. In the years to follow, we will be importing a lot more iconic JDM cars such as Toyota MR2, Mitsubishi GTO, Honda Prelude, Skyline R33, Toyota Supra, Mazda RX7, Mitsubishi Eclipse, NSX Type R, Nissan 240SX, Skyline R34 as they all become legally importable to the USA under the 25 years old rule. At JDM EXPO, with over 36 years of business experience in the Japanese automotive industry, we have always achieved a high level of customer satisfaction while maintaining a distinct reputation for the quality of our cars and the cost efficiency of our business practices. If you are in the market to purchase your dream JDM, never hesitate to contact us as we guarantee the quality of our services and the performance of our cars, all offered at unbeatable market prices! For your inquiries regarding to our inventory vehicles and services, feel free to contact us as we will always be glad to serve you! No Middlemen - An importer is simply a middleman. For example, they offer JDM cars for sale at a higher price than JDM EXPO because they had to buy the car from an exporter in Japan and then add their profit onto it. 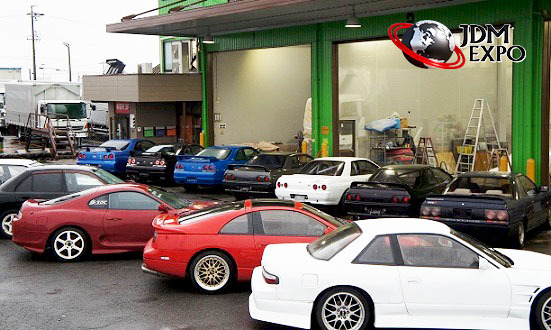 With us, it's like you get to buy your JDM car directly from the exporter in Japan. Real Inventory - JDM EXPO has the biggest inventory of JDM cars in Japan and the world. We have 6 lots in Nagoya and greater Aichi prefecture area in Japan with dozens of Nissan Skylines R32, R 33, R34, Toyota Supras, Mazda RX-7s, Honda NSXs, Nissan Silvias and many other JDM sports and classic cars for sale, ready to be sent to our USA office. Many importers don't actually have the cars they are advertising, they simply list a Japanese dealers' inventory as their own. At JDM EXPO, you have an option to choose one out of hundred real cars and we can send any of them to our facility in New York for your review. Real Experience - For example, Nissan Skyline R32 has only been legal to import into the USA since 2014. That means most of the importers selling them have only been in existence for a few years, if that. JDM EXPO has already been in this business for over 36 years and has been shipping Japan's most iconic cars to worldwide markets for decades. We are the largest JDM cars exporter in Japan and have achieved distinct reputation for our customer satisfaction from almost every part of the world namely Australia, North America, UK, Europe, China, the South East and Middle East. Also, we are number one choice of the US military personnel stationed in Japan with daily sales of JDM cars to the American serviceman located in Okinawa, Misawa, Sasebo, Yokosuka and other US military bases in Japan. Honest Business Practices - We don't make you pay up front. Many importers want you to pay in full before they will ship the car out. This is because they don't have a car to ship, they use your money to buy a car at auction. If you don't like the car when you see it, you're stuck because you've already paid for it! If the car has issues the importer didn't know about because they bought it sight unseen, too bad because you own the car! With JDM EXPO, you put down a deposit to cover shipping & import fees, you view the car at our NY facility and if you change your mind, no problem. If it's everything you dreamed of, only then do you pay! Sign up to be the first to know about our operation news, newly arrived vehicles and other great deals!